In Tibetan language, “Namtso Lake” means “Heavenly Lake”. 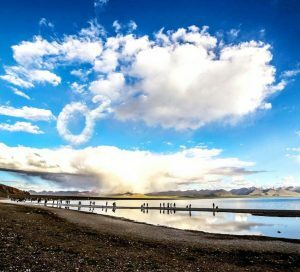 As the largest lake in Tibet, it also won the reputation of the world’s highest salt lake. Its surface is about at 4.740 meters above the sea level, with 70 kilometers long and 30 kilometers broad. Holy Namtso Lake is famous for its lofty altitude, stunning beauty, pure blue water and spiritual associations. Tashi Dor is one of the peninsulas protruding into Namtso Lake from its south-eastern corner. A hill of ten meters stand in the middle of the island. At the North-side of the peninsula is lined with many bizarre peristalses and stone peaks, which formed a Karst landform. Besides, there is a monastery and several hermit caves on it. Tashi Temple, which is surrounded by incense, means auspicious for Tibetan. People hold most Namtso’s religious activities there every year.Beside the ritual path, there lies a big cave named Lianhuasheng cave.Furthermore, it is said that a natural lotus pagoda is in the cave. Mali Pile, a kind of cone-shaped pile, was laid down by stones.When passing by the Mani Pile, believers will put a stone onto the pile. What’s more, a pair of huge yak’s hones with some scriptures and various colors of hada were also dedicated here. At an altitude of 5100 meters, Lachen La Pass is an important attraction for travelers. It is the mountain pass from Nyenchen Thanglha (snow mountain ranges) to Namtso Lake. 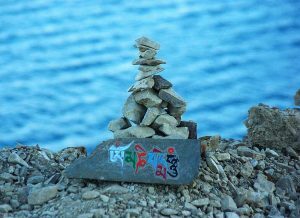 When standing there, travelers can view the whole beauty of holy Namtso Lake. Thus, the sense of achievement will rise in the mind. As a Tibetan traditional festival, Shoton Festival was hold in the late of June and early of July. In Tibetan language, Shoton means eating yogurt festival. Therefore,Yogurt Festival is the another name of Shoton Festival. During the festival, opera performances and grand ceremony of sunning the Buddha are the important activities. Besides, hiking meeting and Jiashan Ancient Road Hiking there are the activities travelers cannot miss. Each goat year in Tibetan calendar, Buddhas, Budhisattvas and Dharma Protectoor set dharma assembly here. There is a saying that if people circle the lake each goat year, it surpass tens of thousands of times chant than usual. Therefore, numerous monks or pilgrims hiking here especially in a goat year. An important reason for travelers to stay overnight is the unforgettable scene here. If you are a shutterbug, Namtso Lake is the destination you cannot miss. 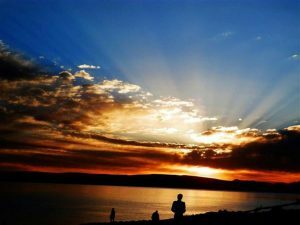 The prime photography time is before and after sunrise and sunset within half an hour. Crystal blue lake surface with the golden Nyenchen Thanglha Range is intoxicating. In the same way, you can do some other activities such as riding horse and Yak, campfire, etc. If you are fond of this holy lake, you can plan your Namtso tour with Tibet Travel Expert. More information about Tibet Tour, please follow our Tibet Travel Blog.